Diamond Creek water does just that and it also flushes out the lactic acid built up from heavy weight lifting. After switching to Diamond Creek water, I noticed a quicker recovery rate and I am able to hit the gym sooner with maximize performance and endurance. This amazing water took my physique to another level. As a bodybuilder and a IFBB Bikini Pro competitor, I have to drink a lot of water to keep my muscles hydrated and also to replenished the fluids lost during my training. Diamond Creek water does just that and it also flushes out the lactic acid built up from heavy weight lifting. After switching to Diamond Creek water, I noticed a quicker recovery rate and I am able to hit the gym sooner with maximize performance and endurance. This amazing water took my physique to another level. 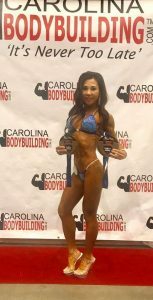 The things that have the most direct impact on my athletic performance are the ability to train and to recover as a NPC Bikini competitor and bodybuilder!! I have been drinking alkaline ionized water for a while now and the benefits are amazing!! Diamond Creek has improved my performance and recovery in a profound way. It keeps me hydrated and energized on those long days at the gym. I love it and drink it daily!! On any given Sunday, our race car temperatures can reach 130 degrees inside, which can peak my core body temp to around 101 degrees. During a nearly 4 hour race, I’m shedding around 10-13 pounds of water weight. Dehydration causes fatigue & decreased reaction time by up to 30% so as you can imagine, I definitely can’t afford that going almost 200 mph. I drink Diamond Creek Ionized Spring Water because it provides more oxygen to my cells, helping with overall hydration and energy levels during the race. With back to back races, recovery time is crucial. @DiamondCreekH2O… Best natural energy drink! I have never been a big water drinker, that is until I was introduced to Diamond Creek. The taste of water is important as well as the many benefits. With my race car reaching extreme temperatures, staying hydrated is a must! I have struggled in the past with drinking just water alone to achieve this, Diamond Creek makes it easy. I find myself feeling better not only after races but the next day as well. and benefits from Diamond Creek. We cannot thank you enough! I’ve been drinking Diamond Creek water since the beginning of the year, and I saw immediate results. It not only helps with hydration, but helps reduce lactic acid and decreases soreness. I had ankle surgery in late May, and Diamond Creek helped keep my inflammation down and helped me get back to 100%!! I recommend it to everybody! I’ve heard athletes say they feel “stronger,” “more athletic” or “lighter on their feet” when they drink Ionized water. I wasn’t so sure. But Diamond Creek Water I really do feel great and lighter. I never thought I would be a water snob. Since becoming a Burn Boot Camp owner and committing my life to fitness and good health, I am very aware of what I eat or drink. 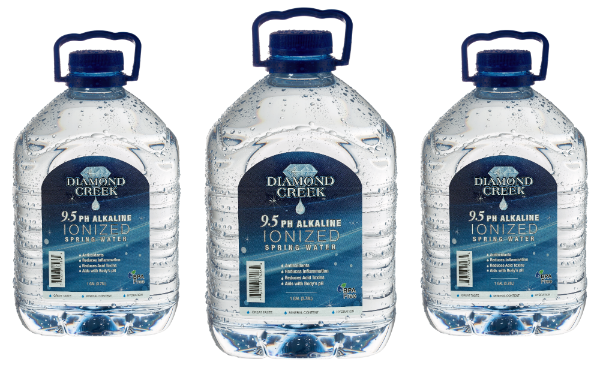 The first time I drank Diamond Creek water I knew I was hooked. The thing that got me right away was how smooth it was and that it actually had a slight taste which I really enjoy. Not to mention the health benefits and the minerals that you are feeding to your body. Not only am I hooked on it but my children ask for “the blue bottle water” over anything else! How awesome it that! As an endurance athlete with Lupus, I’m always trying to find products that will help my performance and keep me healthy during my training and races. Diamond Creek High Alkaline Water is amazing. I’ve been drinking the water consistently for 2 months. Since drinking the water, I have noticed increased hydration, lower inflammation, quicker recovery and better overall performance. The water is everything it says that it is. As a person with several autoimmune diseases, this water is now a permanent part of my everyday supplement plan. It makes me feel healthier, stronger and capable of battling my chronic disease symptoms. Thank you Diamond Creek Water for changing my life! My daughter was diagnosed with Gastritis (inflammation of the stomach) in October 2015. Tap water and bottled water made her nauseous so she did what any 19 year old would do, she quit drinking it. She was hospitalized with dehydration in February of 2016. A friend recommended trying Diamond Creek water for it’s alkalinity. We tried it and it helped! Other alkaline waters weren’t as effective so I assume there is something more to the story. There is not a day that I don’t have my pantry stocked with Diamond Creek. Thank you so much for what you are doing! It’s not just for a healthy lifestyle, it saved her life! A million times, Thank you! Diamond Creek Water is one of the best waters I have ever tasted. The level of quality and details are very important to creating the best high quality water in any product and I feel Diamond Creek has achieved that. I love it and my family loves it as well. To say I was skeptical as to any difference in the taste, hydration and health of water is an understatement, until I tried Diamond Creek 9.5ph Alkaline Spring Water. I am the owner of Hilliard Studio Method and HSM|Core along with my daughter Clary. I work out hard everyday and teach high energy classes which require efficient blasts of water in between shouting out cues for exercises. Diamond Creek delivers the hydration I need efficiently and effectively just like my workout! With the reduced acidity and filtration it also tastes really good. I’m simply hooked and so are my clients! As an endurance runner nothing is as important as hydration. Proper hydration before, during and after is crucial to getting the best results. I have been using Diamond Creek High PH water for the last six months and have noticed physically and mentally my training has improved. The high PH concentration in Diamond Creek water reduces inflammation in my body which enhances recovery from my long 20mile runs when my legs take a beating. Using Diamond Creek high PH water every day I feel a better quality of overall life. A big Thank You to Diamond Creek Water for supplying Miss Mary Wilson of The Supremes, with her pure Alkaline water for her event. She loved it! We love Diamond Creek Alkaline Water! The taste is crisp, fresh, delicious , and good for your health! Our customers love it and I would highly recommend it to anyone looking for a great clean drinking water. Thank you Diamond Creek for playing such a huge role in helping me achieve a personal best at Beach2Battleship Full Triathlon this past October. I raced Ironman Texas in May with a time of 11:51 to racing Beach2Battleship in a time of 10:52…almost an hour faster! The one thing I did differently was to incorporate Diamond Creek water into my training and racing…and for this, I thank you. Your water has become a staple in not only my training and racing but in my everyday life. Thank you Diamond Creek! My daughter is a competitive gymnast and works out 20+ hours per week. Her workouts are very demanding and she was constantly waking up sore and achy the next day. We discovered Diamond Creek Water several months ago and immediately noticed a huge difference in her hydration during practice and the soreness she had been experiencing was gone. She refuses to drink any other water than Diamond Creek. Thanks for making a product that truly benefits athletes and tastes great! Great Taste, added benefit of feeling increased hydration. We sell Diamond Creek Water at our studio and recommend it to our yoga students for before and after class. By Gods grace and goodness and alkalined water I write this as a cancer conquerer – not a survivor! I am a former law enforcement officer and paramedic, retired into hospice work…. The level of stress in these careers along with raising four children ( most of hose years as a single parent) is something that cannot be expressed by words. We all know that stress and acidity can cause lethal diseases. I was diagnosed with a fourth stage Adenocarcinoma and given two months prognosis. The origin or primary was unknown at that time. I am immediately started researching : alkalizing was the answer and the quickest and most simple, non-complicated method was with water . Water was the jumpstart to this process. Simple and easy -Three months into this journey another PET scan was done and there was no cancer… I am into this miracle for several years.. There are so many sizes and options of bottles to choose from and there is no excuse not to have a bottle with any member of my family at anytime –Not only do I drink it, I cook with it, bathe and brush my teeth with it and my pets drink it as well. My cat’s bladder stones totally went away after two months of drinking this and no medication. The surgery was not an option. I maintain my alkaline state, healthier skin,electrolyte balance and energy, a purified liver and healthy kidneys by drinking this water. How simple is this?I could go on and on about big Pharma and but I will simply state that the key to prevention, maintenance, and overall miracles is in Diamond Creek water.